Pitt Police officers Michelle McDaniel and Jonathan Beck inspect Chris Chirdon’s bike outside Posvar Hall as part of Bike to Campus Day. Chirdon, a University Honors College staffer, said he tries to bike the 9.5 miles from his Shaler Townsh. In recognition of national Bike to Work Day, bicycle commuters were treated to breakfast, giveaways, a prize drawing and discount coupons. The May 20 event drew record participation — 33 registrants, up from 29 registrants last year and only seven in Pitt’s initial event in 2009, said Janet D. Thomas, assistant director for parking. In partnership with the Oakland Transportation Management Association, riders who registered their bikes received bike inspections and reflective backpacks filled with maps, information and safety gear including a pocket-sized first aid kit, reflectors and a clip-on LED headlight. 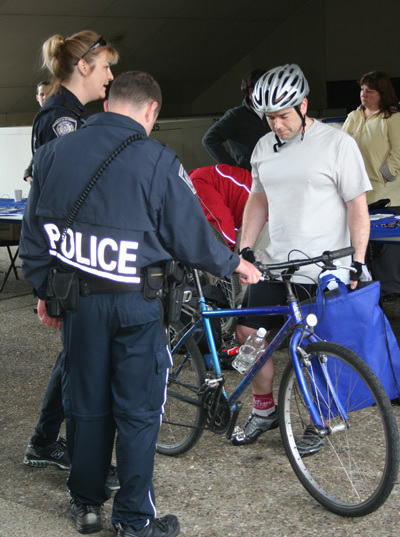 Police checked bikes for safety, examining brakes, tire pressure, chain oil and general structural conditions. They advised riders to register their bikes and keep them locked up when not in use. McDaniel said officers routinely check campus bike racks and take any unlocked bikes to the station for safekeeping. Attempts to notify the owner can be difficult if a bike isn’t registered, she said. Read original article at http://www.utimes.pitt.edu/?p=16653.